Building an ADC with only a few caps and resistors plus the counters of the propeller has impressed me from the beginning. It is not only a very cheap and simple way to read analogue signals but is also very robust against switching noise because peaks are averaged out over the sampling period. However, I was also always wondering why there was so much random noise. No matter how long the sampling period was or how the Cs and Rs were chosen the lowest 2 to 3 bits were always dithering. Chip has found the solution (see P2 discussion here: http://forums.parallax.com/discussion/169298/adc-sampling-breakthrough). To sum it up, the feedback loop forms an oscillator that oscillates with period of several clocks. The start and the end of the sampling cuts a random part of that oscillation because the phase of the feedback loop is not synchronised to the sampling period. If the hard cut is replaced with a smooth fade-in and fade-out the noise is reduced drastically. This could be ideally done in hardware and requires only some counters and adders. Unfortunatelly, we still have to wait until this feature becomes available in the P2. I couldn't wait and have tried to implement this in software in the P1. The noise reduction is probably not as good as it would be with a hardware filter because the resolution is only 4 clocks (per instruction) compared to one. But the noise is still cancelled out somehow. I have recorded some statistics. Without filtering I got 8 LSBs peak-to-peak and 1.9 LSBs RMS noise. 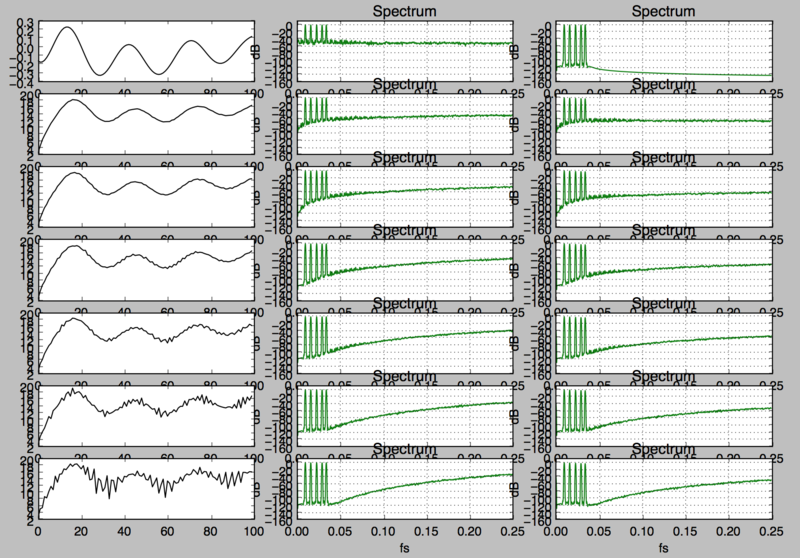 With filtering over 16 shifted sampling windows I got 4 LSBs p-p and 0.37 RMS. With 8 samples I got 5 p-p and 0.82 RMS. The overlapping sampling windows have the advantage of a much lower delay over increasing the sampling period by a factor of 16. That's an average of the difference though? might think of an oscillations are actually processed quantization noise. that completely ruins things - once you have multiple orders of sigma-delta modulation in analog you are close to instability and special measures are needed to contain this. First order modulators are stable. get the lowest total noise out, but you cannot increase the order of the modulator after the sampling point. how higher orders increase the extent of that. Sorry for the confusion. There are "real" sigma-delta ADCs like the PCM1807 for example. They have modulators, digital filters, noise shaping and all that stuff. The built-in so-called sigma-delta ADCs of the propeller are much simpler. They use the "POS detect with feedback" mode of the counters. It's basically a feedback loop balancing charge. The number of ones required to balance the input signal with the feedback bitstream are counted over a fixed period of time. If the feedback loop was ideal it should give a perfect stream of bits and the count value should match the average voltage level independant of sample time. For example half the supply voltage should result in a 0101010... bit pattern. In the real world the feedback loop oscillates at a random frequency resulting in bit patterns like 01001111001110000... The average over a long perod of time is still correct but there's some amount of noise that depends on the exact time where the counter starts and stops. serves as the quantizer. By feeding back to the capacitor you implement 1st-order modulation. usually active circuitry is needed for useful results. the quantization noise is a voltage dependent tone close to the 1:1 ratio. sigma-delta modulation prevents this from happening, and makes the noise more gaussian like. so even a tiny proportion of it aliasing down to DC will destroy your noise performance there. I see, you are much more clever than me. It seems that you have fully understood the theory of sigma delta modulation which I never had. On the other hand I doubt that it would be of much use to me. As soon as active external circuits are needed I think I'll buy a ready-to-use IC from Analog Devices or something. My intention here was to get the best possible out of what we already have, the P1. Adding some lines of code cost nearly nothing and it's nice to get a bit lower noise. Of course, it's still much worse than it could be with a state-of-the-art ADC design. But who cares? It's cheap, it works, and now it's a little bit better. Ok, so I have this circuit that I want to stabilize so that when I measure the time it takes to charge that the numbers are some what stable? Mark is a wiz with filtering. There is a small number of forum members with such knowledge. It is university level, the maths is layered. I dream of crossing the hurdle beyond simple averaging myself. I'd guess the biggest variation will be coming from the execution time of going from resetting PHSA to tristating the output. The charge time is from when INPUT() tristates the output but the counter starts sometime earlier. Try adding a DIRA(PIN) = 0 before the WHILE or before the PHSA = 0. That should help at least. The number is not the issue. Those instructions always take the same amount of time. But the counter answer varies by as much as 16,000 ticks. That's a lot. That's about 200 micro seconds of drift. The alternative is electrical variations. Eg: The 10 Volts is not stable. Thermal changes. Electrical interference. this is RC decay, not sigma delta. With RC decay the information is in the amount of time until the comperator input flips. There's only one state change, not multiple sample bits. If that single information is wrong then all you can do is to start over. You can't filter only one data point. If it's not stable you have to look at the hardware. The electrical input is a 10v battery that is discharging as the unit consumes power. The only noise is the change from a low state on the pin to a floating state. One would think this is a stable network and should be easy to measure consistently but it is not. This is similar to how an ADC works except there is no sample and hold circuit. I just tried it with a ceramic capacitor of 1 nF (your 1 uF is way too big). I get values around 990, which is a 10bit resolution and the variation is max 4 digits, mostly it changes only between 991 and 992, if I hold my breath and don't move I can see the same value 10 times in a row. With 1uF you get something like 17bit resolution and it's a heavy load for the pin, no wonder that the values varies a lot. So the P1 hardware is good for 10..12 bits, the main problem with the SigmaDelta ADC is the 80 MHz clock. If you lower the system frequency you can get quite stable results, also without windowing. The P1 counters miss a prescaler for such things.